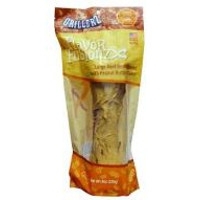 Grillerz Flavor Fusion Large Beef Bone Basted Peanut Butter Flavor | Brazos Feed & Supply, Inc.
Grillerz are produced with bones and natural cuts, and are made incredibly delicious by using our unique method of slow roasting. Grillerz, Little Grillerz and Flavor Fusionz are made in America and produced according to the highest standards of quality and safety at our facility in Newport, Indiana. We use only U.S. livestock that is HAACP certified and tested for quality. Grillerz are processed in our HAACP certified and APHIS approved facility.